The highly anticipated opening of Fast and Furious Supercharged is coming ever closer. Until now, we knew very little about the attraction coming to the Universal Orlando Resort. BUT NOW, we have some major details outlining what we can expect from this attraction. I know for myself and many Universal Studios fans, we figured it would be a transplant of the attraction from Universal Studios Hollywood. But it looks and seems as though it is getting a similar treatment as Kong: Skull Island. Large vehicles and probably more scenes than what we have in Hollywood. Regardless, it is exciting to get another attraction at the resort as well as to see how the virtual line system can be implemented and improved upon. Below is the press release regarding the newest attraction coming to the resort as well as a pretty cool Behind the Scenes video showing the making of the attraction! 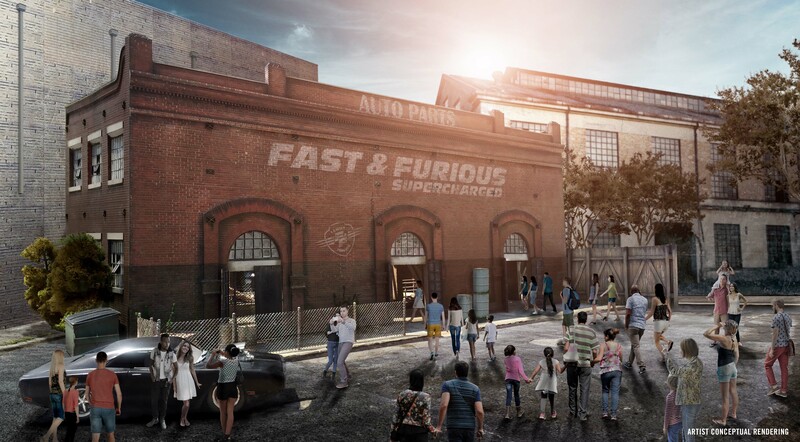 Soon, Universal Orlando’s newest attraction, Fast & Furious – Supercharged, will race into Universal Studios Florida and bring one of the world’s hottest film franchises to life in a whole new way. Inside, you’re immersed in the ultimate Fast & Furious experience. Hit songs from the films’ soundtracks fill the rooms as memorable scenes from the series play around you. You make your way through familiar places inspired by the films, like the Family Room – complete with photos of the Fast family – and Tej’s high-tech War Room. You are invited to attend a race after-party that can’t be missed, and Tej arranges for a custom party bus to get you there. Universal Orlando Resort is a unique vacation destination that is part of the NBCUniversal Comcast family. For more than 25 years, Universal Orlando has been creating epic vacations for the entire family – incredible experiences that place guests in the heart of powerful stories and adventures. Universal Orlando’s three theme parks, Universal Studios Florida, Universal’s Islands of Adventure and Universal’s Volcano Bay, are home to some of the world’s most exciting and innovative theme park experiences – including The Wizarding World of Harry Potter-Hogsmeade and The Wizarding World of Harry Potter-Diagon Alley. Universal Orlando’s on-site hotels, Loews Portofino Bay Hotel, the Hard Rock Hotel, Loews Royal Pacific Resort, Loews Sapphire Falls Resort and Universal’s Cabana Bay Beach Resort, feature a total of 5,600 rooms and are destinations unto themselves. Its entertainment complex, Universal CityWalk, offers dining and entertainment for every member of the family. Universal Orlando Resort consistently unveils all-new guest experiences, including powerful attractions, incredible dining opportunities and dramatically themed hotels. Now open is Universal’s Volcano Bay, an entirely new water theme park, and Race Through New York Starring Jimmy Fallon, an immersive and interactive attraction in Universal Studios Florida. Universal Orlando Resort is part of NBCUniversal, a Comcast company. Follow us on our blog, Facebook, Twitter, Instagram and YouTube.